The Kyser Instrument Care Pack is perfect for cleaning and maintaining your guitar and is also great value for money. With 3 simple cleaning steps you can increase the quality of your instrument and sound tremendously. Everything you need to keep your instrument looking and sounding amazing in one box. Everything you need to keep your instrument looking and sounding amazing in one box. 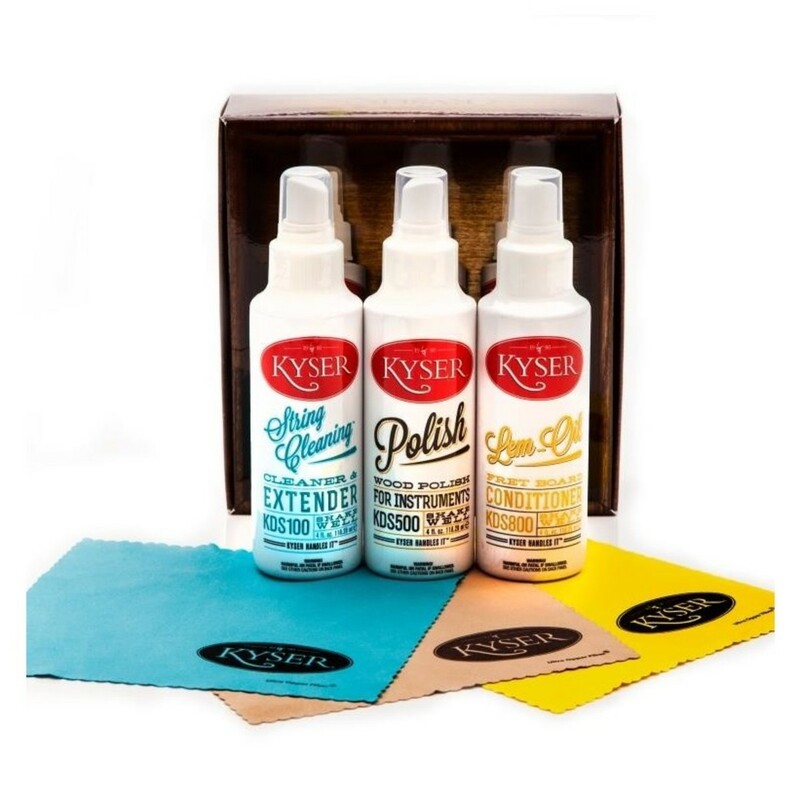 One 4oz bottle of Kyser Lem – Oil, Kyser Instrument Polish and Kyser String Cleaner as well as three colour coded Opper Fiber cleaning cloths. All items in the pack are made in the USA. Kyser Lem – Oil is an ideal choice for musicians who want to keep their fretboard from drying out which is very important for prolonging the life of your instrument. The smoother your fretboard is, the faster and easier your guitar will play. Next time you change your strings, use Lem - Oil to clean your fretboard and fingerboard. Kyser Instrument Polish keeps your instrument shiny but also keeps off the oil and grime that makes its way into the wood grain over time as it removes build up before it has a chance to start. The cleaner your instrument is the better it feels and the better it plays. Polishing your instrument can also maintain its value for years. Kyser String Cleaner is ideal for cleaning and maintaining your strings. Clean strings make an amazing improvement to the sound of your instrument, clear tone makes all the difference in the quality of sound. Kyser String Cleaning reaches the hardest parts to clean on your guitar to remove the oily residue that dulls your sound. It also lubricates the strings and removes the string buzz. This product allows you to get the most out of your instrument.